Home/Uncategorized/Where in the world is Jan? Where in the world is Jan? I would like to introduce you to our final, original member of our studio group. Jan Rasikas is a beginning weaver with a loom that is old enough to have seen lots more weaving than all of us in our group, combined. I wish that it could share some of its weaving memories, although the way that it creaks as Jan beats the weft, it seems as though maybe it is trying to speak. Hard to believe that it used to be peptol bismal pink. If you can see in the picture above, Jan is weaving a handspun yarn, that she created, directly from the swift. Not sure that has ever been done before; but that is what I like about weaving as a beginner. Who is to say what can or can’t be done. We don’t need no stinkin teachers…actually we probably could use a little guidance once in awhile. As long as it doesn’t cramp our style. Right Jan? Jan started out spinning a couple of years; bought a Schact and has surpassed her teacher (me) in the quality and fineness of her beautiful handspuns. Right now she is spinning a camel and tussah silk and getting ready to ply it. Can’t wait to see the finished yarn and I warn her now, that if she leaves it at the studio, she may find me curled up on the rug cuddling it. I love the way her treadles are worn by the many feet that have used them. 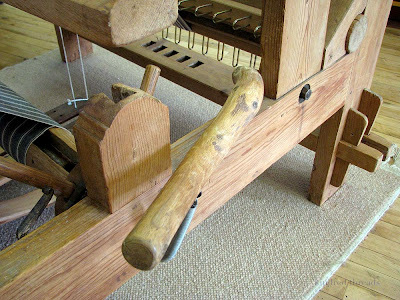 This loom has lots of personality; the brake release looks like it’s right off the tree. 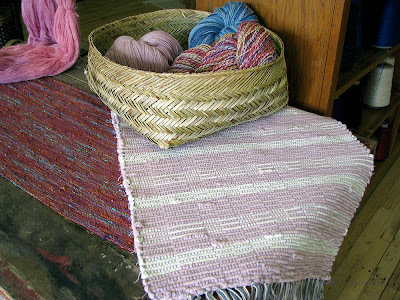 This pink and white rag rug is one of the first projects off Jan’s loom, perhaps in honor of the looms original color?? I look forward to her next project because she has visions of a linen warp (we are unafraid or perhaps foolish). She has such a patience and preciseness in her weaving that I am sure she will be a match for linen. I am always wondering where in the world is Jan? We are very fortunate in our small town to have such a wonderful, member owned, organic grocery store option available to us. Jan has been, in a large part, responsible for providing the guidance and vision to make this coop a reality. She must be very proud of all that she has accomplished. Now we just have to get her in here weaving more. I am excited to share this weaving journey with her. So happy to see you at your Swedish loom!